The Everyday Homeschooler’s Guide to Teaching the Early Years. It will help you forge that path between teaching and letting your child follow his/her own interests. It guides you on how to foster creativity and create an ideal environment for learning. 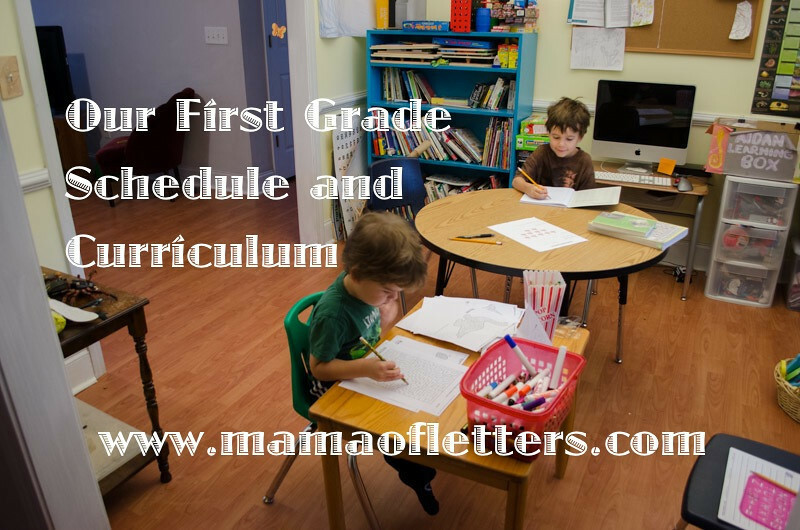 And for those who need it, it also contains a 1st grade course of study, tips on scheduling and lesson planning, how to meet other homeschoolers, and a list of reputable curriculums. I consider my plans to be like a compass that can point me back to our main path if we get lost, but if we find a better way, we’ll continue our course. There are also times when it feels prudent to do something else with the boys, or maybe I just need to get some cleaning done. The biggest benefit of homeschooling is its flexibility. I never want to get too rigid with a schedule, or I may miss some valuable teaching moments! With that said, I came up with a class schedule before we started our official 1st grade year on September 3rd. You can see it below. Surprisingly, this has held up well, though we missed one week due to illness. My main goal this year is to help my seven-year-old gain better reading skills, though I’m going at his pace. I have made a point of getting these lessons out of the way first thing in the morning because otherwise I don’t think they’d get done. The reading lesson + math or Spanish lesson usually takes only 60-75 minutes to complete. You may think I’m unwise to teach academic lessons only four days a week, and math only two days a week. Drilling my son is not what I want for our homeschool. I have found he has progressed just fine on a schedule like this. This is because we take it at his pace, we go over a concept again and again until he gets it, and going slowly has prevented me from having to hear too many moans and groans from him. He doesn’t like the formal lessons, but he knows they are necessary. He also knows we have time to do what is important to him. You can click this image to view it larger, if you want. 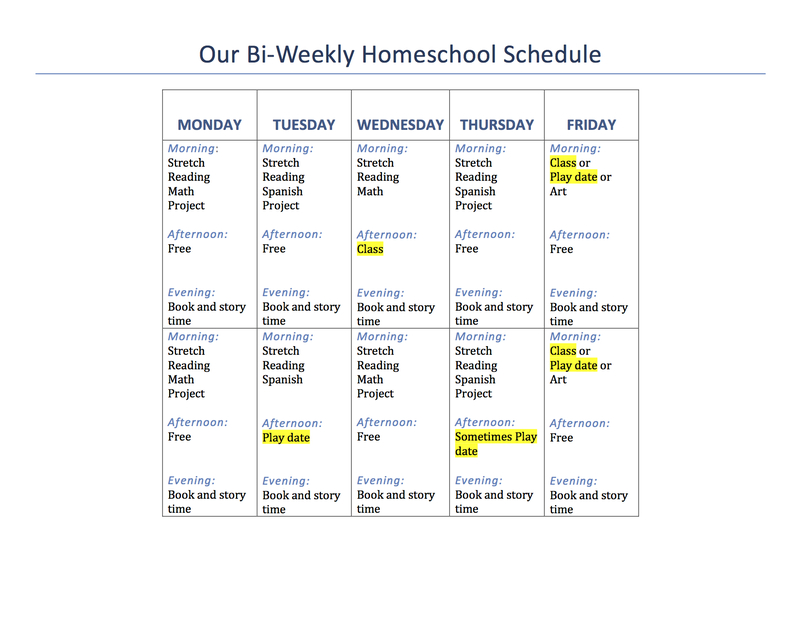 It’s a two-week schedule because most of our classes and play dates are bi-weekly. One more note about the schedule before I move on to our curriculum. Even though it looks very manageable with lots of free time, it’s amazing how stuff creeps in. Add a day camp, going to grandpa’s house or the library, shopping, cooking, cleaning, or going on a family field trip, and we stay very busy! Living 30 minutes from town makes our lives more complicated because it’s too tiring to go one place in the morning and then go shopping later. I’m not sure I’ll ever feel like we’re that free. Stretch Time – This is new and experimental. For many reasons, I have started a short stretching, quasi-yoga time with the boys in the morning for about 15 minutes before lessons. I do simple stretches that I learned in grade school as well as some simple yoga poses, and we make up animal names for them. My four-year-old came up with the “sperm whale” pose! My aversion-to-any-physical-activity seven-year-old does not like this at all. So I’m thinking hard about how I can make it more appealing, or if I’ll ditch it altogether. If we continue this practice, I will be sure to write about it in the future. For a good beginners guide on yoga for adults, I have been enjoying eckhartyoga.com. Spanish – My son has said several times he wants to learn Spanish, but I know I have to be careful about how I approach this, or he will change his mind. I feel very fortunate to have found the show Salsa, which is available online for free from Georgia Public Broadcasting. He loves it. We are keeping a Spanish journal and writing down the key words that each episode focuses on, and we read over all the words before we watch. (I do the writing here – at this point I want learning Spanish to be fun, and I don’t care if he doesn’t remember the words.) My son also requests for me to read the synopsis and a page or two of the English transcript of the show before we watch just to give him an idea of what’s happening. This has been a fun, slow-paced way to introduce him to the Spanish language, and now he knows a handful of Spanish words! I’m planning to make some Spanish labels of household items to put up around the house in order to remind me to use a little Spanish throughout the day. 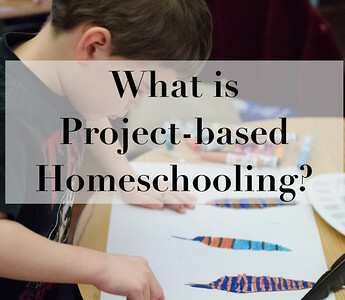 Project time – THIS IS THE MAIN FOCUS OF OUR HOME EDUCATION, and if you don’t already know what this is, you need to read What is Project-based Homeschooling. This is the time I have set aside for my son’s projects, and unless we sleep very late in the morning, it usually works out to be about two hours before lunch. But this doesn’t mean we don’t sometimes work on his projects on the weekends or in the afternoons. Projects also weave their way into our book time and family outings. To see a list of my son’s projects, look at my page Project-based Homeschooling projects page. You’ll see his projects have covered most other requirements in a Typical Course of Study, particularly science. My son is a little biologist! Discovering Great Artists: Hands-On Art for Children in the Styles of the Great Masters by Maryann F. Kohl and Kim Solga – We use the Kindle e-book, but you can buy a hardcopy too. We have only done the first activity so far, but the boys really enjoyed it. Amy Hoods Arts and her new magazine, Art Together – I bought and read her first issue, and I know I’m going to enjoy referring to her activities for art instruction. I want to teach my son about the color wheel. The seven-year-old’s painting with homemade egg tempura paint. Unfortunately, there’s not enough time for everything! There are so many things I want to do with the boys, but there aren’t enough hours in the day to do it all. However, I know we’ll fit in the following things whenever we can! Book time – There are still days when we sit on the sofa for a long book time, but I miss doing this everyday. Once the kids are solid in their reading skills, perhaps our reading lesson time can turn into a book time when everyone takes turns reading. However, we do read books every evening. It’s part of our evening routine. Currently, my husband is reading the Magic Tree House series to my seven-year-old. They are on book #25! (Good history lessons!) 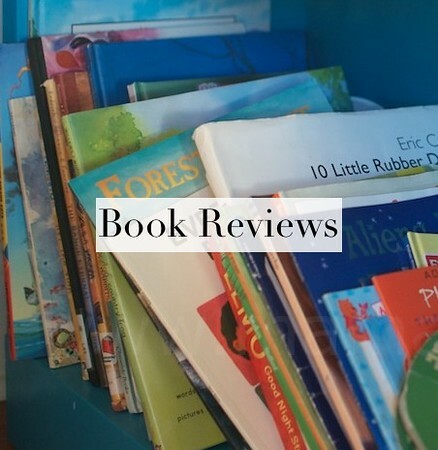 I look at storybooks with the four-year-old. 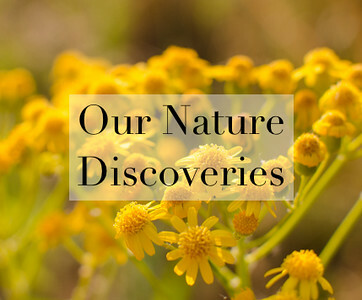 Nature Exploration, Nature Journal and the Junior Ranger Program – These are on-going activities that get done when they get done. Fortunately, we’re a nature-loving family, so getting out into nature is part of our lifestyle, but sometimes I feel like we don’t do it enough. Puppet Shows – If you have been reading my blog for a long time, you may remember how puppet shows were a integral part of our day during my son’s Pre-K year. Unfortunately, we don’t do them anymore, although the boys will play with the puppets sometimes. I have been wondering how I can get us back into this, even one day a week. Hmmm. Don’t homeschool if you want a neat house. Watching lots of educational television – As I’ve written before, I don’t mind that my children watch a lot of television as long as it’s quality T.V. and as long as they’re balancing T.V. time with plenty of other activities. Before getting married, I wasn’t a T.V. watcher, but I’ve been sucked in, and I have to admit, I like the shows we watch together, and my sons watch mostly educational kids shows on their own. (And a few purely entertaining ones.) I have a pinterest board where I pin some of these shows, if you’re interested. 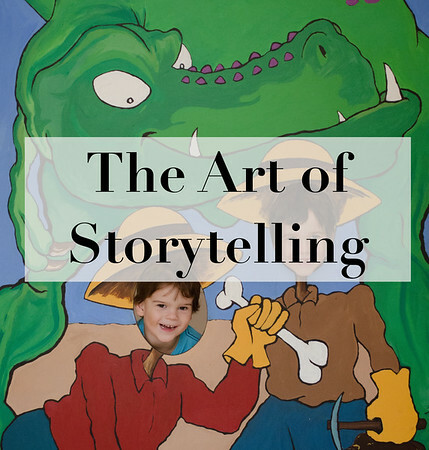 Storytelling – I still tell my seven-year-old a story every night before bed. My husband tells the four-year-old stories. Down time – Down time usually means digital device or T.V. time for my boys. Fighting against this has done nothing but cause stress for me, so I’ve learned to just go with it, which I wrote about in my series about T.V. For me the ideal down time is sitting on my front porch enjoying some beautiful weather. Play time – Fortunately, my kids always seem to be in ‘play mode,’ but I want to make sure they have time to play by themselves. Sometimes they play with friends. Sometimes they play together. Sometimes they want to play with their dad or me. I hope they’ll remember a childhood full of playtime. Outside time – I used to have no problem getting my kids outside. Now we’ve gone through a spell where I’ve had to be more intentional about getting them outside, but we do like the outdoors as a family, so I know it’ll always be part of what we do. Cooking – And believe it or not, I’ve started cooking more and having the boys help me in the kitchen! You can read more about this in My Menu Planning Resolution. Wow! When I write it all down, I wonder how we manage all that! But somehow we do…one step at a time. If you have actually read all the way down to this, I want to thank you for reading this monster post! See a list of the rest of my posts about 1st grade and how I’m approaching it differently with my younger son here. Thanks for mentioning Art Together, too! I haven’t forgotten your suggestion about how to encourage perfectionist kids to move beyond mistakes. I interviewed my kids about what they do when something doesn’t go according to plan. I love his motorcycle. 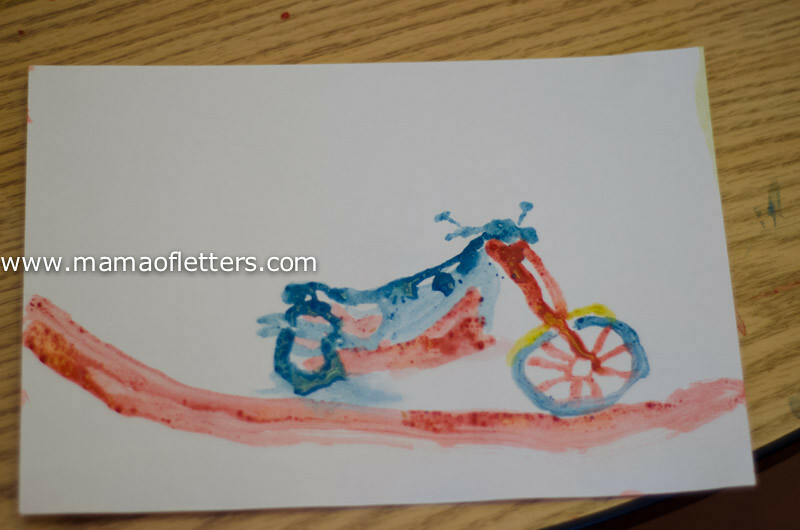 You know, not until I was an adult did I realize that watercolor paintings begin with sketches…I thought those amazing painters were getting all that down in just paint. Not so! Learning *that* definitely took some pressure off!! Hi Amy ~ Thanks for your comment! I would be interested in learning more about your suggestions for morning movement. What I need especially, though, for the seven-year-old is to work on his flexibility, and also help with some neck pain he can get because he sits doing projects so much. Shelli, this is a wonderfully informative article. 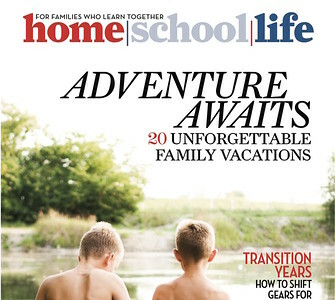 It is refreshing to read honesty and insight about homeschooling younger kids whose attentions are draw elsewhere. I appreciate that you allow educational videos and don’t get bogged down in controlling the technology too much, a struggle for me with two older tech-enthralled children and a younger one learning by example. As usual, your reality reads as inspiration because it takes into consideration the whole picture – family dynamics and health, childhood needs and goals, love and patience. Wow; I am so jealous, a homeschool room and a good camera! Looks like you guys are having all kinds of fun. We definitely are! At least most days! Lots of good stuff here, Shelli! Thank you for mentioning my blog. I know we wrote back and forth a bit about the “problem” with having your son want to dictate too much! There are worse problems to have, but still, there is only so much time in the day. Patricia – Thank you for your comment! I appreciate your advice very much, and I think it’s a good idea to lay off of it for awhile (which is what I’ve been doing out of necessity). I will definitely look for that opportunity when I might be able to offer dictation when he needs/wants it. Thanks so much for your comment, Kim. I’m going to e-mail you! I just found your blog as I searched for how to start homeschooling. My family may be making a short term move to Australia (18 months) and I’m considering homeschooling my six year old rather than deal with the staggered school year Down Under. Any advice on how to build a 1st grade curriculum? Where do I even begin? Obviously we’ll be in an exciting new place so I’d like to incorporate activities, trips and projects as much as possible. I welcome any advice you can give. Thanks for your terrific blog! Hi Debbie — First, thank you for your kind comment about my blog. And I’m a wee bit jealous about your upcoming sojourn! I have a good friend in Australia, and I’ve always wanted to visit her. Anyway, to answer your question, I would first sit down and brainstorm about your own priorities — what are the most important things you want to impart to your child at his current age? 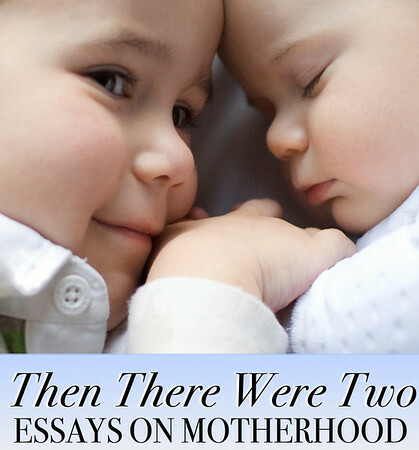 I wrote a few posts when my boys were younger about my priorities. I even wrote a mission statement, though I don’t think that’s necessary. At that time, I felt it was most important for them to have time to play, use their imaginations, explore, get into nature as well as be immersed in literature and storytelling. I have found that as they’ve gotten older, these priorities haven’t really changed. So on those days when I start freaking out about academics, I try to remember what I truly believe is most beneficial for them at this young age. For math, I have used Life of Fred (LOF) and various workbooks that you can pick up at Target or the bookstore. (Right now I’m really liking some workbooks by Brainquest. They are covering a lot.) We like it, but again, I have heard some people don’t like LOF. I haven’t worried about the other subjects because we cover just about everything else through my son’s interests and library books. We also watch documentaries everyday, and I am amazed at what we ALL learn through those. I also use project-based homeschooling (PBH) techniques, and I’ve been so very happy with the results. I have a tab at the top of my blog labeled PBH, and if you look there, I’ve written more about it and listed my specific posts about that. In short, however, I would say that using these techniques have made my kids so independent when it comes to learning and fostering creativity. It’s amazing! Okay, what else? I have consulted a list of “What your child should know” etc. I use this: http://www.worldbook.com/free-educational-resources/typical-course-of-study It’s helpful, but I wouldn’t stress over it. I usually grab some library books whenever I see a gap in their learning. Seriously, if I were you, I would concentrate more on getting all you can out of Australia. Find the zoos, nature centers, museums, natural places and go enjoy. 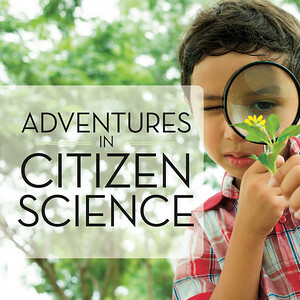 Your child’s natural curiosity will be sparked, and you can visit the library every month too. I keep a chart with subjects listed at the top, and I check off (and take brief notes) about what my kids do each day. As I go through our year, I find that we have covered everything while still keeping my priorities in check. This has been much easier for me and less stressful than following a prescribed curriculum. My boys just couldn’t sit at a desk all day to do things I ask them to do, especially when they were younger, and that’s not what I want their homeschooling to look like anyway. 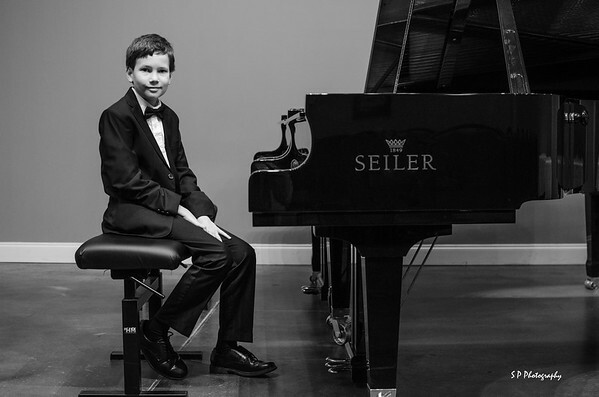 Now that my oldest is eight, I’m finding I can “require” more formal work from him, but I still make sure he has a lot of time for his many projects. Hi Shelli, First off Love your blog! Love the daily schedule idea you posted, doesn’t seem overwhelming. I am new to homeschooling. 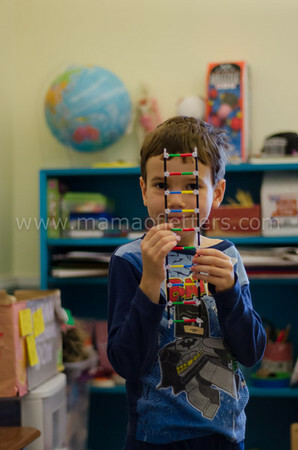 My son is 6, is autistic, in Kindergarten, I am thinking about homeschooling him. We are not happy with his school’s approach to things. His safety is also a HUGE concern. I am so nervous about homeschooling, I didn’t do that great in school, I was in special education myself, I am far from being a teacher, but I have enjoyed the teaching moments I’ve had with my son; his homework, times before school of teaching my son to talk, teaching him to read, etc. I feel he is a little bit behind and I could be teaching him, I feel I can’t as long as he is going to school~there just isn’t enough time by the time he comes home, he is so tired after a long day of schooling, and I don’t want him to feel overwhelmed and/or school crammed down on him. My main problem I have is being nervous and constantly wondering if I can do it. Wish me luck. I’m new to homeschooling and am so much at a loss as to how to start. My oldest is in first grade and he’s always done work books and loved it. Loves to read as well. But I’m having to go to a mandatory meeting with the homeschool division asks I’m not sure what to expect. They said I need a formal lesson plan asks reading logs. I just need advice. New state and now homeschooling….what can go wrong? Hi Aubrey, First, take some deep breaths because you can definitely do this. First, you need to join some local homeschool forums in your state. I found several by checking Yahoo Groups when I first started homeschooling, and now there are many groups on Facebook, and you can probably find a group for your state or either ask for members (on a national list) who are from your state. And then ask them what the regulations mean and what exactly you need to do. 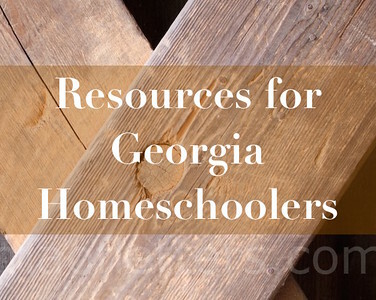 We do not have any kind of homeschool division in Georgia (gosh–I’d be curious to know what state you’re in because I’ve never heard of that! ), but I’m guessing all you need to do is make a list of subjects you’re planning to cover and a list of resources you are planning to use while you homeschool. Get some workbooks, and write those down. You might find some online resources or make a list of library books you are planning to check out. You can probably get the course of study from your local school’s website, and use that as a guide, but you certainly don’t need to follow it exactly. I am sorry & I wish I could help you more, but without being familiar with your state’s laws, I can only make guesses. You really need to find some local homeschoolers to help you out. I’m sure they’ll ease your mind. But if there’s anything else I can do to help, please just ask. Meghan — Thanks so much for your comment. I’m sitting at my computer right now working on my guidebook, and I’m thrilled to see that I’m trying to answer the very questions you are asking! I think my post will answer some of them too (I did not do all subjects everyday), but if you have any other questions, feel free to e-mail me back. My guidebook obviously won’t be done soon, but I’m always available by e-mail and happy to help people. Hi there. I just googled “first grade homeschool” and your post is one of the first links I found. I haven’t read this yet but wanted to respond to your request at the top! I would love to know what you think the essentials for first grade are. I’m going into our second year of homeschooling. My oldest will be in third. My younger son will be in first. He’s great with math and reading is starting to pick up! He also has sensory issues (fairly mild) and a speech delay that is improving. I do not want to get crazy with curriculum for him but always wonder what others think is the minimum required for each grade. I also have a 2 year old and 4 year old so I have to be somewhat focused. 🙂 Thanks! Hi there — That’s a great question! Thank you! For me, the minimum is me reading aloud to them, teaching them to read, and math, and that’s really all I worked on in my son’s early years, and that’s my focus right now for my six-year-old. It’s not that they don’t learn about the other “subjects,” but we find learning moments in our daily lives constantly. 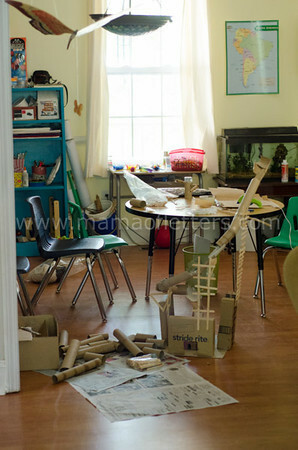 We used to attend a lot of science classes at our nature center. We read science books, and we watch science and history documentaries. So they are learning a lot! But learning how to read is essential for moving on to more focused things, and I really feel that doing a little bit of math each year will make it so much easier down the road when you get into higher math. Other than this, I would focus on their interests and simply check out a lot of library books. Perhaps your son will enjoy reading about history or you want to focus on classic literature. In first grade, I think the formal lessons can be kept to a minimum, and it’s important to let the child have a lot of free play time! I hope this helps, and you’ve given me something to add in my guide, so thank you! Hi, I came here because I’m always thinking about home schooling. My daughter comes home so stressed and exhausted and she’s only 6. My main interest in public school is the social aspect because we are so isolated otherwise. No friends or church connections ect. I’m not from where I live now. You live in GA too, why did you choose to home school? I don’t like the long school year and short Summer’s they get. And everything is so rigid, even art is about copying this artist and not being your own artist. But I’m not an organized person and I don’t know how I’d keep ourselves on task if I attempted home school. But my daughter would get more sleep. She naturally sleeps from 11pm to 10am. Now I have to wake her at 7am and she’s so miserable. I’m naturally a late night person too. We just don’t fit in to the world. Hence no friends. This will be my first year homeschooling. I am so nervous. Your schedule is putting my mind at ease. Any advice for a first timer? I will be homeschooling a 1st grader and 2nd grader? How far in advance do you plan what you teach? Do you lesson plan over the summer? My name is Alisha. I came across your blog while searching for first grade schedules for homeschooling. I am excited at the wealth of information provided and how easy it is and was to incorporate many of these ideas into our daily routine. The resources you provide are amazing and extremely helpful. We are in transition to homeschooling more, but I do it when we are at home while I can and that works for me. The Spanish website is a hit with my 6 year old and so many other aspects. The suggestions are easy, simple and can be tailored to fit any home. Of course, you do what works for your family, but this is a great start. 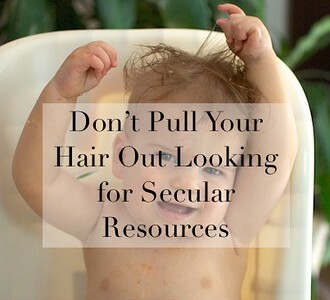 I was one of the moms that didn’t know where to start and I am still figuring it out, but coming over to your blog helped me to keep it simple. You can’t cover everything and I think that’s where the initial stress comes in is wanting to do too much all at once. The key really is consistently. Our children are always learning and they will give us great suggestions of things they want to know more about. I’m learning to learn from him and it’s really cool. Thank you. I am willing to talk to other parents, connect more with you Shelli and encourage other parents out there to keep going because you got this. I can be contacted via email at acarter_2006@yahoo.com. You are your child’s best teacher and they love you for trying and doing. Have a blessed day everyone! I just stumbled upon this blog, so I am probably too late with this response. However, I saw you asked how to use puppets. I spent many years teaching MS/HS French, primarily, but other subjects/grades also. I can tell you puppets are great in Foreign Lang for creating funny dialogue experiences/videos etc. It helps the speaker feel less pressured bc the eyes aren’t on him, they are on the puppet’s mouth. I teach now private french lessons, and this has worked for me in this setting also. Just allows us to mix it up a bit. Hope that helps. I landed here searching for what library books should I check out for my first grader. We do reading lessons, math and writing pretty much daily. I have been using the library for the rest. If he shows great interest in a topic, such as Indians in the Thanksgiving story we go back for more books on that. But we hit the slumps where we’ve exhausted a subject for the time and I’m not sure where to go from there. Thanks so much for your comment, and I’m sorry it’s taken me so long to reply. The upcoming holidays are keeping me extra busy this year! At six-years-old, you don’t have to spend a long time each day teaching your son. If you can carve out 30 minutes to an hour, that would be perfect. You can get most of the things you need from the library, and/or you could visit a bookstore and pick up some workbooks for 1st grade. The most important thing is just making a habit of sitting down everyday and working a little bit on what he needs most. Have him copy the alphabet and numbers everyday, and he could also copy sentences. This will help him learn how to form the letters. Most importantly, read to him a lot!! Go to the library and check out books that he likes — and also some books that you think would be good for him. You can also check your local school’s website. They usually post their goals for each grade there. Good luck! Thanks for your post. Have been doing a blend of homeschool/unschooling for my 3 and 6 year old. We are in NY and have to fill out quarterly reports, so getting ready to do that this year. I see so many people who are super structured, time managed planned lessons and I just think,I can’t do that! Happy to see your laid back approach. Will keep it in mind as the year progresses. So far trying to have our yearly goal- you should be able to do x,y and z at your age, then loosely get those things done. One thing I am enjoying is that we can dive into subjects that interest everyone, and try to get as much as possible out of that particular question/subject. Also we can do things at higher grade levels when appropriate. My 6 yr old loves math. Really love it, so we are doing 2nd and 3rd grade math because he was interested. Thank you! Hope all is continuing to go smoothly for you.